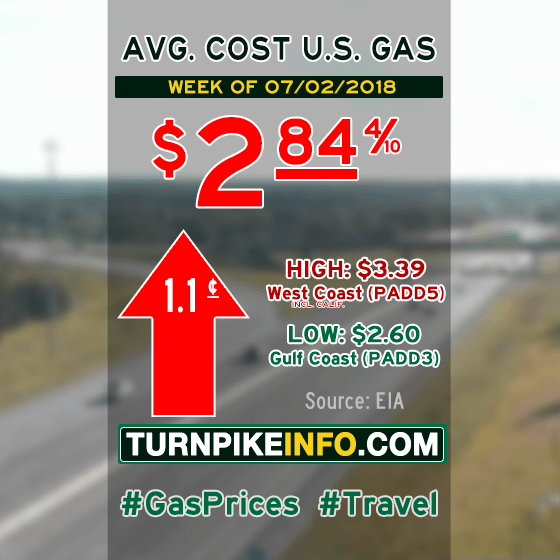 Fort Lauderdale, FL – The nation’s gas prices did an about-face during the past week, turning higher after several weeks of steady declines, according to the U.S. Energy Information Administration. The weekly E.I.A. fuel price survey shows the nation’s average cost for a gallon of regular unleaded ticked upward by about a penny to $2.84. Prices went up in nearly all regions, in some cases by a significant measure. Drivers in the Midwest saw their average visit to the pump cost more than four extra pennies per gallon this week. Curiously, prices declined in the two regions that typically define the nation’s highest and lowest gas prices: the West Coast and the Gulf Coast, respectively. Diesel fuel prices went up at nearly twice the pace of regular gasoline, and prices went up in all regions, according to the E.I.A. The average cost of a gallon of diesel increased two cents to nearly $3.24. This week’s average fuel prices for all regions are shown below, as gathered from www.eia.gov.